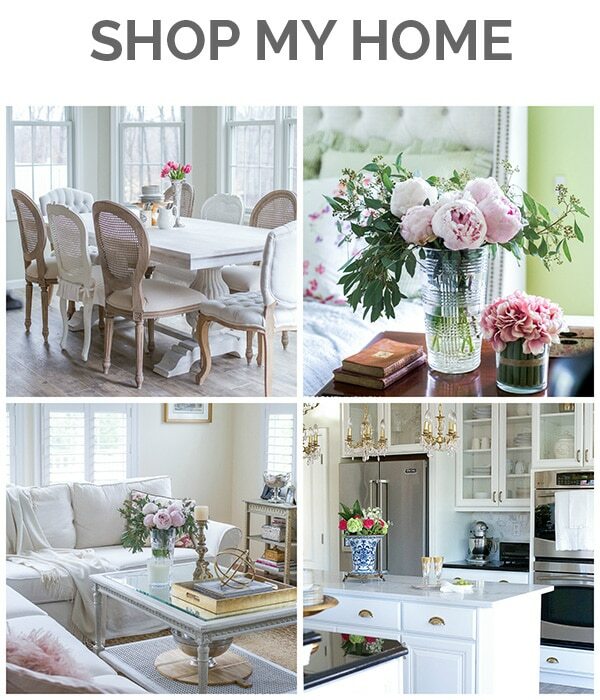 Welcome to the next installment of The One Room Challenge Week 5 | Styling a Book Shelf! For those who missed the first few posts, the challenge is a series designed to show the transformation of a room in 6 weeks. 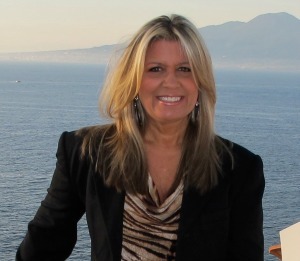 In Week 3 I revealed the main wall in the room, furnished and styled with an entry vignette. This week I’ll be addressing the opposite side of the room, the only other corner of the room that has enough space for furniture. 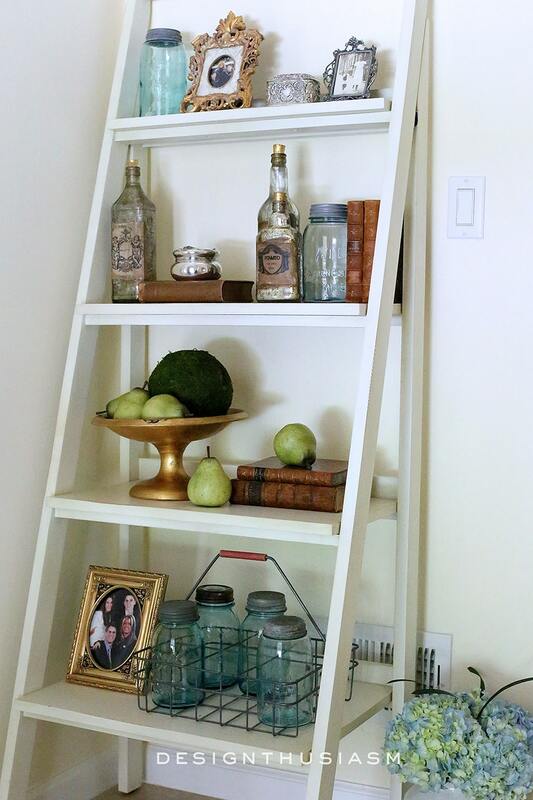 I started with an ivory ladder bookshelf and my task was to style it for a pleasant welcome when we come home through this entrance. 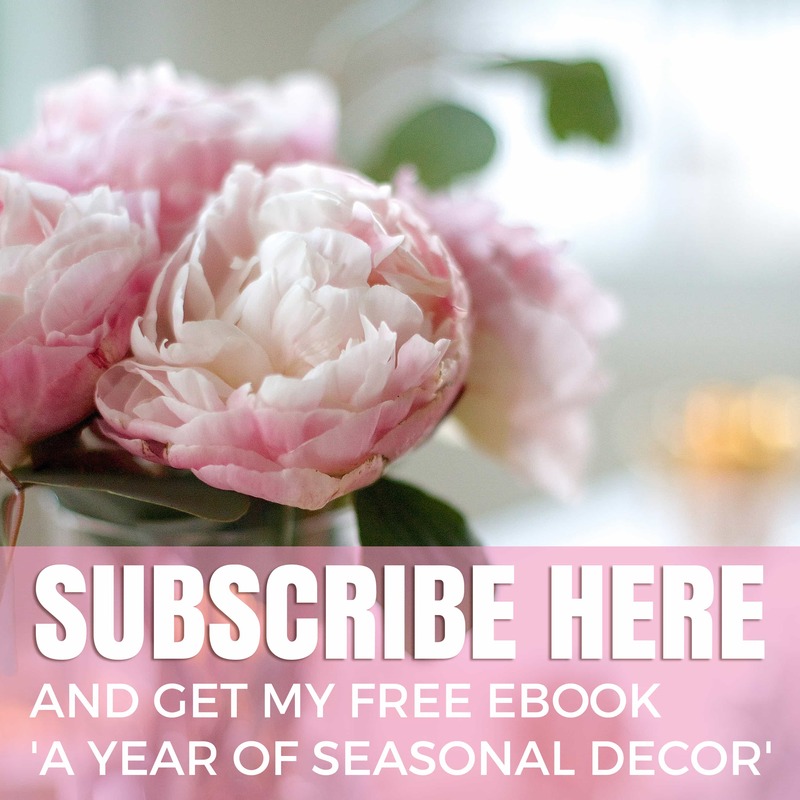 I wanted to stay with the same general feeling presented in the entry vignette, with neutral tones, a touch of bling and small pops of color delivered mostly through greenery. 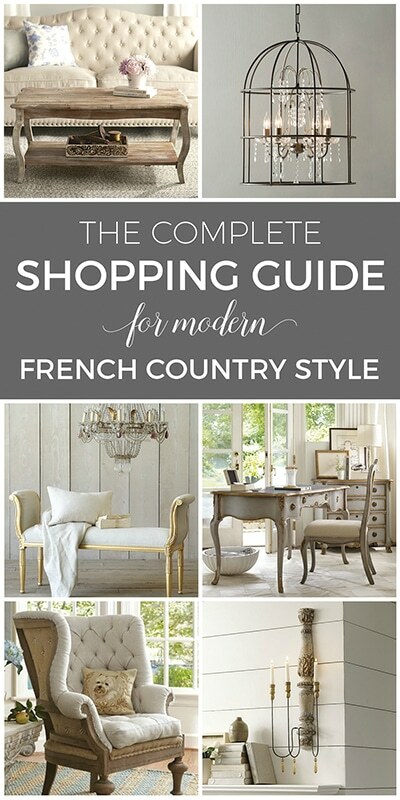 As with most of my rooms, this corner is adorned with vintage pieces and retro French reproductions. 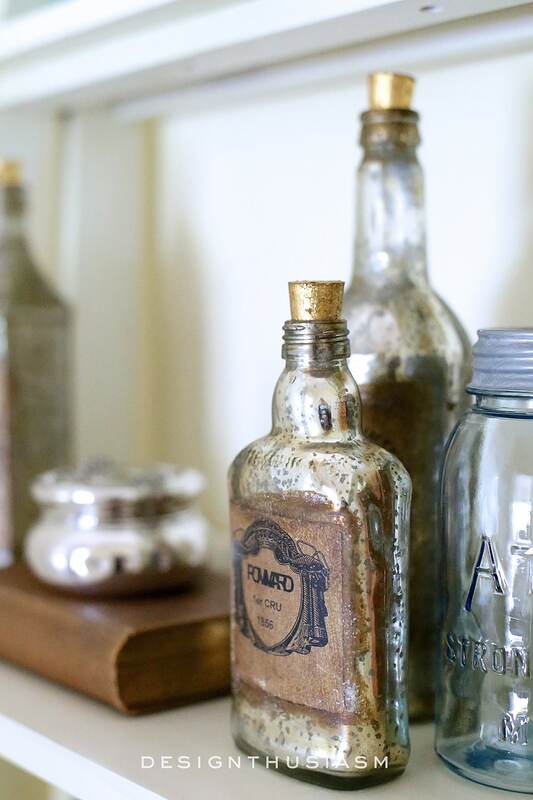 The mercury glass bottles add just the right note of timeworn patina and a pleasant glimmer. 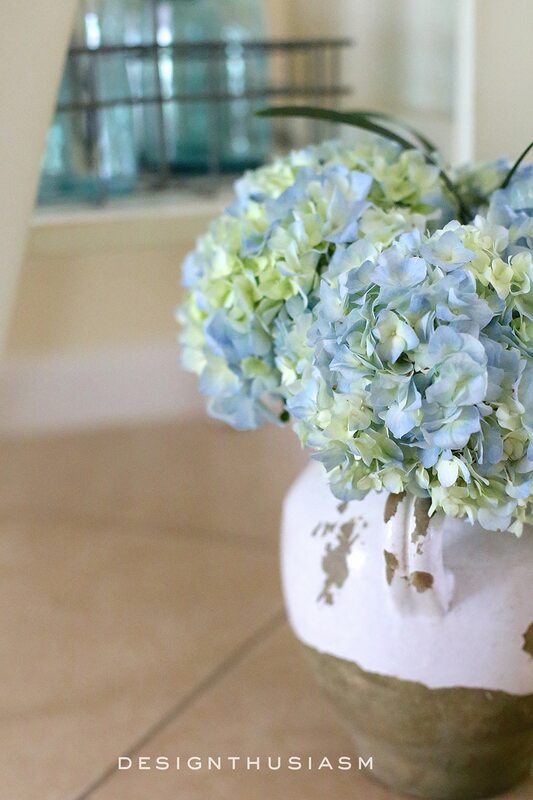 The tuscan vase holds pale blue hydrangea, the perfect complement to the pops of color on the shelf. 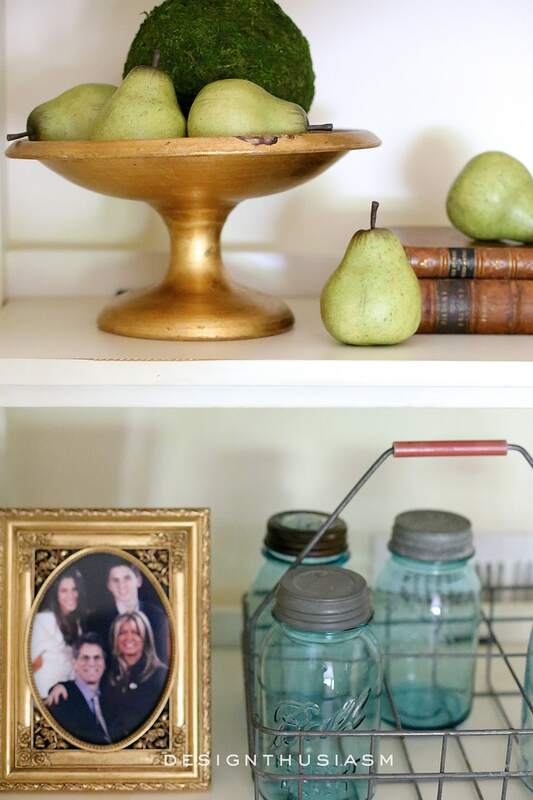 The top shelf features a vintage photo in a vintage frame, as well as an ornate gilded picture frame bought in Megève, France. 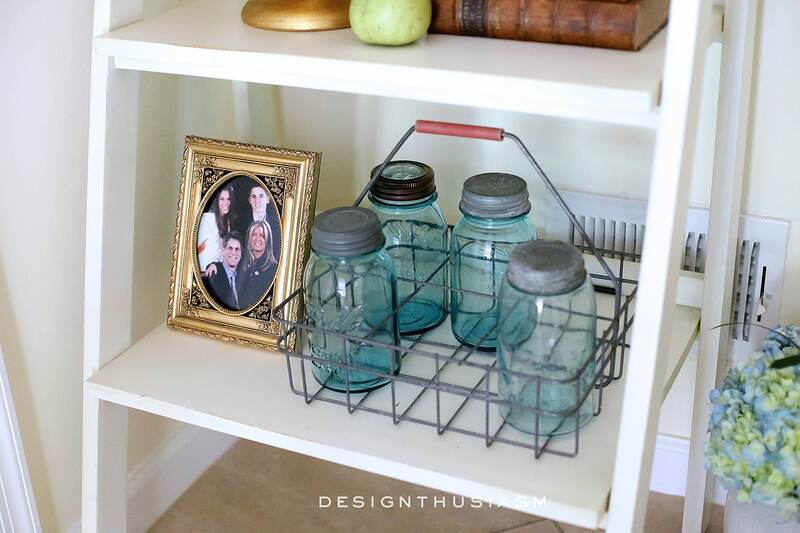 The antique mason jar bears a date of great significance to our family, so I had to buy it! 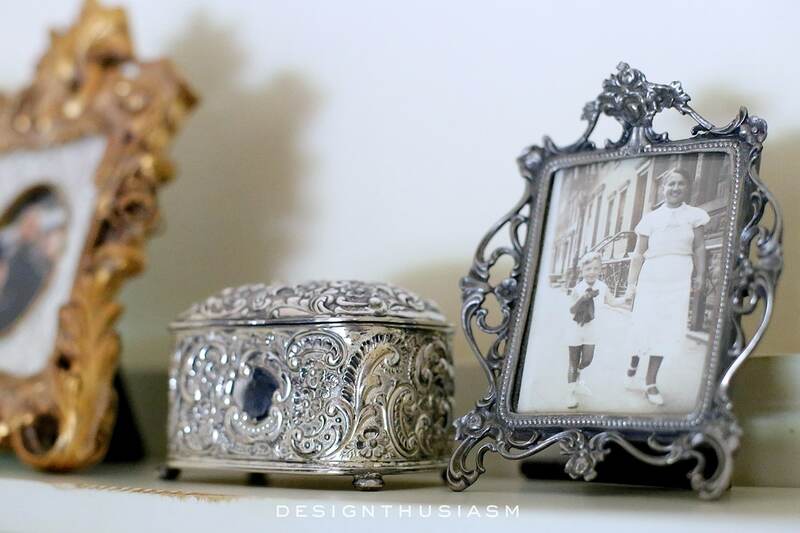 The little silver jewelry casket is nestled among the photos on this narrow shelf. It’s a great place to keep small change at the ready, for when running out the door. 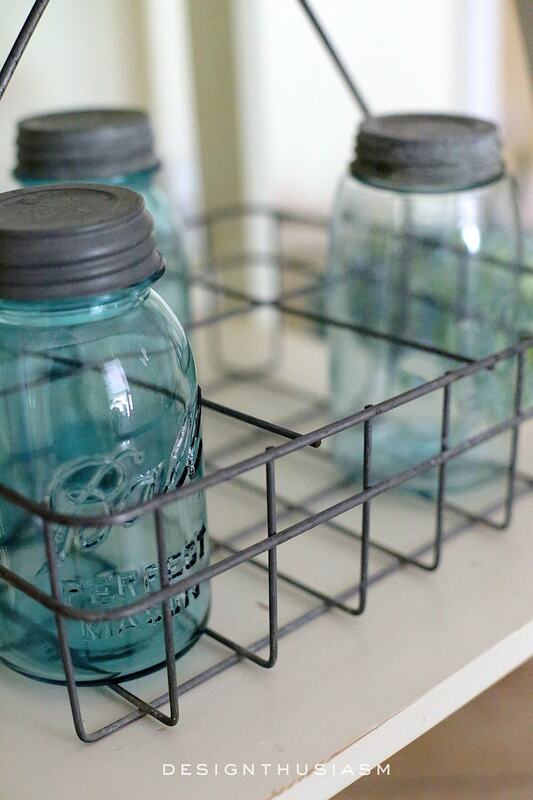 The blue vintage mason jars are a recent purchase, along with the antique wire basket that corrals them in. 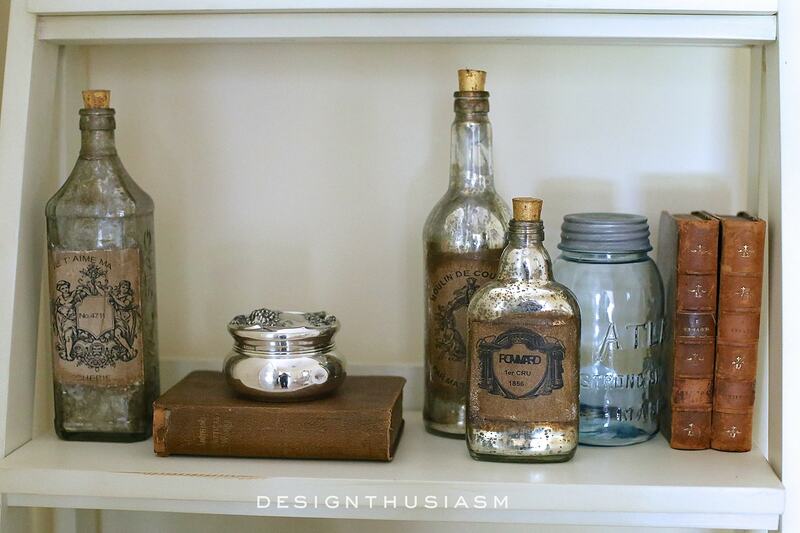 I like that they lend a casual tone to the vignette, mixed in with the more serious pieces of gold and silver. 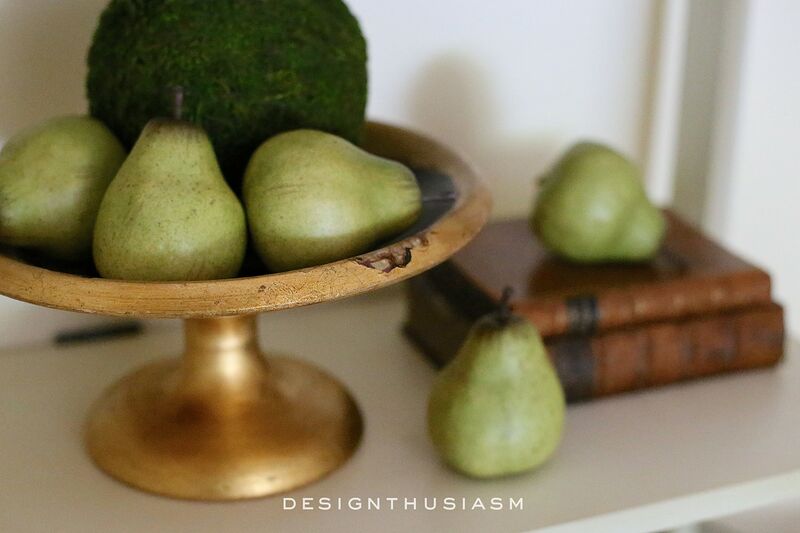 The pears are faux and I just love their shape and the sculptural element they add. 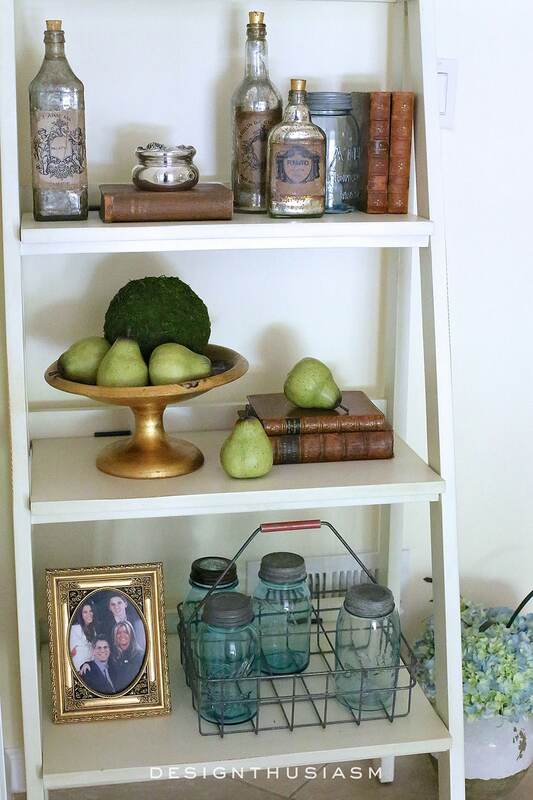 The old leather-bound books are the heart of this shelf styling, given that it’s a bookcase. 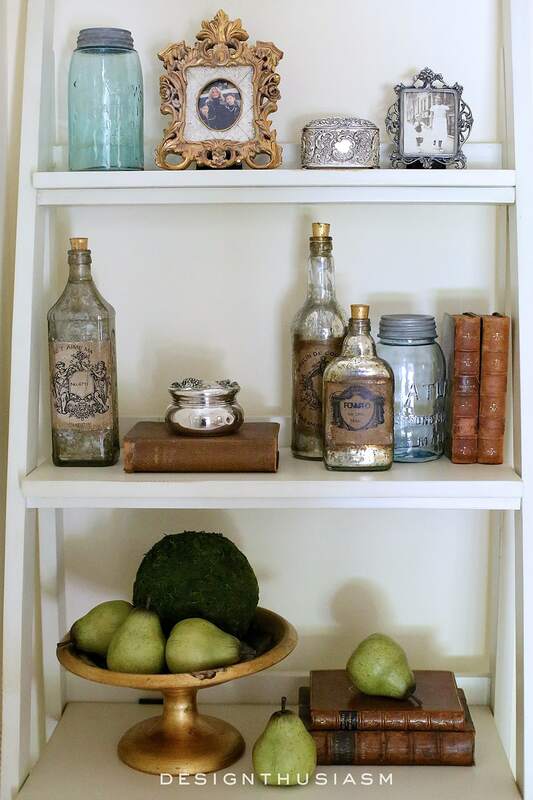 I wanted each shelf to present its own still life, and time was taken with the placement of each object. The gilded serving bowl is a wonderful piece, raising its contents up for an interesting presentation. 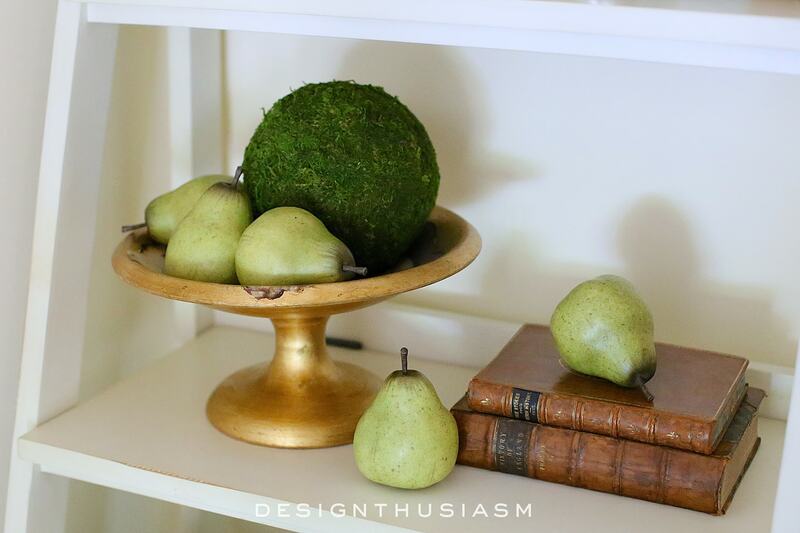 The bowl itself has a lovely shimmer with subdued golden patina. It’s delightful to arrive home and be greeted by family photos, particularly presented in such pretty frames. Next week I’ll be pulling it all together, with some final touches and the full view. 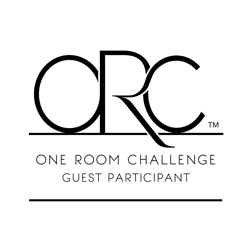 Please enjoy the other posts linked at the One Room Challenge logo below. 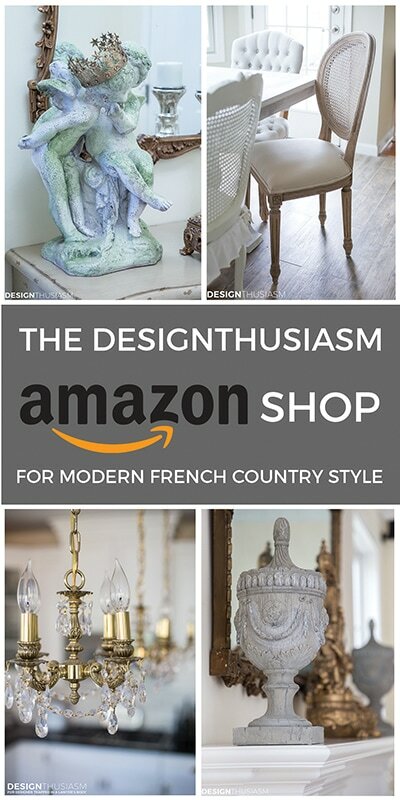 Lory, I love those Mercury glass bottles! Was that DIY, or did you buy them like that? I love your whole put-together!